It was back in March 2010 when a person contacted me (by e-mail) from Romania, he introduced himself as a therapist for Massage-Reflexo-Therapy & he was practicing Dry Cupping at his clinic, he was interested to learn more, as he heard that cupping is well understood by Muslims. I introduced him with wet cupping which is "Hijamah", the drainage of blood from underneath the skin. He never knew that "Hijamah" is another way of cupping. I gave him all the guidelines of doing Hijamah with the most adequate techniques; and I told him that it is the treatment that was adopted & recommended by Prophet Muhammad Sallallaho Alaihe Wasallam. Being a therapist, it was just a matter of few days that he got trained for making the tiny incisions, & he was amazed with the healing results reported by his patients. Then it all began, he used to write back frequently & it was the Decision of Allah that a HIJAMAH CLINIC opened in Romania. Once a friend of mine wrote about some of his doubts regarding Hijamah, instead of writing to him by myself, I asked Mr. Pirnevan Constantin to provide his own explanation, he wrote back with a beautiful title "Testimony of a Christian about the Islamic Prophetic Medicine" (his message dated July 12th, 2010). I requested him from the first day that Hijamah of women should be performed only by a female Hijamah therapist, so he trained his wife for handling female patients. And he wrote "In 2010 I made with my wife 46 HIJAMAH procedures. All glory is to God! All patients had a real recovery". We are thankful to Mr. Constantin for his trust & belief on medicine of our beloved Prophet Muhammad Sallallaho Alaihe Wasallam. And we pray for the couple & their children to be blessed with peace, happiness, health & wealth. Listed below is the text of his various e-mails. My name is PIRNEVAN IULIAN CONSTANTIN and I am a therapist .I live in Romania and I practice therapy at home. Address: VILLAGE SAMBATENI NR 229 AREA CODE 317233 TOWN ARAD COUNTRY ROMANIA EUROPE. In 1978 I graduated the Technical school. I had worked a few years in constructions and afterwards I worked at a school as a technical instructor .In the last 6 years along with my wife I took a course in the domain of therapy and we opened our own cabinet where we work as therapists .We have many patients who have problems with the vertebral colon, knees and with their shoulders. We have also patients who suffer from a bad blood circulation .With the help of the reflex therapy we help patients who have problems with their kidneys , digestive system , diabetics , and hepatitis .Three years ago we bought from a Chinese firm cupping , I used the manual and I combined the massage with those cupping obtaining great results. I really want to continue my specialty in this domain. I am one of the very few therapists from Romania that use cupping .From the internet I read that the Muslims are the best specialists in this domain so that is why I contacted you. Although we are from different cultures I have hope and faith that God will encourage you to tell me more about your knowledge. In this way you will become my first teacher in this domain. In order to help me I would need visuals materials with explanations. I read in your article that you put a lot of emphasis on the Tibb-e-Nabwi foods & herbs and I don’t know anything about this, so if you please give more information I would be grateful to you. I have the QORAN translated in Romanian and if I need to read from it for a better understanding please specify the surah number and verse number. Thank you for your understanding. The spiritual illnesses and the magical attacks have become more numerous I the last years and I would like to help those who suffer from them with the cupping. Maybe it is shocking for you this request of help from a Christian but I believe with all my heart that there is only a God and it is different only our way of understanding Him. I thank you very much having the faith that you will help me. I am very impressed by what you wrote to me. I dare see you as a brother who is wiling to help another brother in the name of the Only True and Alive God. I live in the west part of Romania. My village is quite big .I earn monthly around 500$ .My income is somewhere in the middle average. In my next mail I will attach pictures with myself and with the region where I live. I read what you have recommended me from the Koran and it is big and impressing. I have copied your articles. I prey that God will give you strength to continue to share your holy knowledge. You are right I have used only the dry cupping. I understand now what HIJAMA means .It will be hard for me to use it and I will be the first Romanian who will use it for the benefit of our fellows. After the revolution from 1989 there are many magical practices used by gypsies. That is why I am very interested to help those who suffer with the help of Hijama. Furthermore, I have copied your article “Where+to+Cup”.I find it rather difficult, the way I should deal with the spiritual illnesses. I would need more details: how to prey before Hijama, the specific points on the human body for Hijama, and preys after the procedure of Hijama. Beside that, I don’t know how to handle the Hijama for the cases of infertility (especially for women) for them if you please I would need explanation in more detail .I am also interested in dealing with hepatitis, diabetes. If you can send me pictures or short movies I would be more than happy .I hope you will continue to help me. What do you recommend me to read from Koran? I want to start by thanking you for your advice and I contacted Mr. Shuaib Suria .I have managed to translate the verses from Koran and I grouped them .I have recited them and I have to admit that it transmitted me joy , strength , delight , positive energy .Beside that , I read your article about Henna but I cannot find it in our country .In Romania we use for the purification of blood a combination of garlic , honey and apple vinegar .I personally like to use the hot infusions because they are easy to do and also quite cheap .My favorite infusion is the ginseng tea with cinnamon sweetened with honey .I would be interested the way you prepare the apple cider. In Romania I have a certification that implies that I can whenever open a spa centre but that would be too expensive for me .So in my clinic I can use any natural technique for the maintenance of the human body. It is true that, that type of Diploma would help to my prestige but what is the most important for me is to get to know how to use correctly the procedure Hijama . Regarding Tibb-e-Nabwi I read everything I could on your bog and I will try to use them with the ingredients that I can find in Romania .I will keep in touch with you and I will follow your advice. For me you have been a blessing and all I can do for you is prey. I would like to thank you again for your patience and your understanding. A good man out of the good treasure of the heart bringeth forth good things! You are my first master in Hijamah. I prey that God will give you strength to continue to share your holy knowledge. O LORD of hosts, blessed is the man that trustees in thee. Along with this mail I send you an e-book. I have read all the mails that I received from you, I have seen all the pictures and I have copied everything. My soul is full of joy now that I can finally understand what Hijama means. This technique is indeed of divine inspiration .I have translated these materials for my wife too, because she doesn’t speak English. Now, we have begun to practice these incisions and with the help of our Lord we hope to begin the first session next week, and we will go on with the next session. If everything will be ok by the end of May our bodies will be detoxified. Please if it possible for you to send me visual materials for the session nr 4 and 5. We consume home made bread and we use flour and seeds of plants from our areas. We don’t use sugar and the honey from Romania has a good quality. I will use as many ingredients that you said, as I can find. We use olive oil, we eat fish meat. We have the yogurt and milk directly from the farmers from our village. In our own gardens we plant , carrots , onion , garlic , cucumbers , tomatoes , and we have also fruit trees .From May until the end of August along with my wife , we make therapies in a locality at 30 kilometers away from home, where we can find also thermal water .The properties of that water are very special and we make the massage and the reflex therapy and dry cupping .We stay there around 100 days and we perform around 1500 massages .We have patients form the entire Europe .From September till May I work at home in my cabinet .I read everyday from Koran and I really feel that I have gained power , strength and I feel a permanent joy in my heart .Do you have an e- book with the live of the prophet in English ? May the Lord guide you forever and help you with whatever He knows you need. I want to begin by thanking you for the book you have sent me .I began to read it and I am very impressed by it .It will take me a lot longer to finish it , because it is very complex and it requires meditation and I have to process everything. For the Christians, this period is very special because we celebrate the resurrection of Jesus Christ .We also meditate of his death and how much he suffered for us, in order to save us . Afterwards I will use the Hijama procedure to my wife and then we will switch places .I use foe ears problems candles that contain curcuma and the essential oil of eucalypt I use it for aromatherapy. All your advice are very precious for me .The musk perfume is very expensive here .For the aromatherapy we use (mint, orange, lemon and ylang ylang) essential oil .For the massages I usually use olive oil and for other cases I use cream with bees poison. God bless you and thank you for your preys too. I try to answer to all your questions .For the persons for whom I used the procedure Hijamah , I applied the cup three times because the first and the second time the cup was filled with blood very quickly .I had to remove it to empty it and to fulfill it again. I have never collected more than 400 ml of blood .I used the procedure on the patients who had an empty stomach .I told them not to sleep afterwards , I suggested them to take a walk and to drink fruit juice .Every year I treat many truck drivers , until now I made massage but from now on to those who are wiling I will do Hijamah .Thank you for this advice , to use this procedure for the drivers .As I have already said I collect materials to write in this booklet about Hijamah in order to promote it .Any material that you can send me are more than welcomed , but I need some authors for the bibliography . God helped me to do Hijamah also for very rich people .They is very happy with the results. I hope that until September to be able to write that booklet because in that month in my town, will be a congress about complementary therapies and I want to go to make a demonstration in front of many people. I look forward hearing from you .thank you for everything .Have a wonderful week. Just as you have said, I really feel the way in which God guides me and my wife. He gives health to our patients and He guides both our hands and our minds. In the last few days along with my wife, we have applies the procedure Hijamah to a family from Germany. They will continue this treatment with us for 12 more days. I am convinced that your prayers and those of your friends helped me. Thank you again for all the materials and articles that you have sent me .I spoke also with Mr. Shuaib Suria and he added my name to the list of Hijamah doers from Europe .I receive emails when new materials appear on the site .Along with this email I will send to you a few pictures where you can see how we did Hijamah to that family from Germany .May God be with you and bless everything you do. Mr Shami , I am so happy that there is a possibility for you to come in Romania and you will be my guest .I am glad also that Mohammed Y. Memon wants to come with you .All I need from you is an email and I will be ready to meet you .My patients spread the word about Hijamah and now there are more and more people eager to try this new procedure .I feel that God is blessing me and my wife in everything that we do .I always explain to my patients before I do the procedure that it is a prophetic treatment recommended by The Messenger of Allah (peace and blessings of Allah be upon him). I am very pleased by the book you have sent me .It will be very useful for me for my booklet .I will give you all the details about the conference .Although in Romania the economical situation is not very good, me and my business is not affected in any way .I consider this as a sign from GOD and that he wants me to do what I do and that he blesses me. I am very excited to hear from you soon and hope we will see each other face to face soon. I have something extraordinary to communicate your! In Romania there is an Islamic organization formed by students, businessmen, doctors from Arab countries, on behalf of this organization are the Islamic League in Romania. 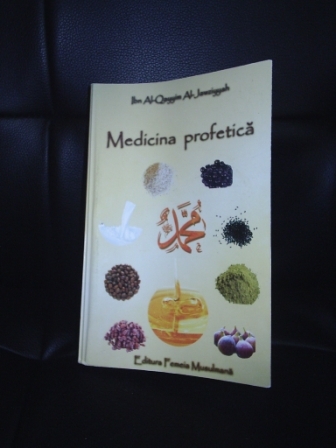 I got in touch with these gentlemen and they sent me the book of Ibn al-Qayyim al-Jawziyyah “Medicine prophetic” translated in Romanian. I am very happy for this gift. In the next two weeks I will make hijamah at four patients. All patients feel great after Hijamah. I made hijamah and the lumbar. You see in the picture attached to email. At 10 km. of my village there is a parking space for cars from Turkey. There was opened a mosque. Good health and God be with you. you have written to me that you will do Hijamah for four Philippines .I am very happy for you .I am convinced that God will take care of them .This type of treatment should be spread all around the world. It will take me more time to get in touch properly with the gentlemen from the Islamic league. They have sent me a book but I feel that they are a bit suspicious, they are not open for a more open relationship .I understand them in a way because there are many people who abuse of these organizations .I will try to get in touch with the Imam of the Moshe that is at 10 km from my house .There is a car park and there are many truck drivers and maybe I will make Hijamah for some of them. God bless you .I will continue to prey for you. With God's help my wife made Hijamah in the top of my head. Along with this mail I send you a few pictures. I feel great. This technique is indeed of divine inspiration. I read the book “Prophetic Medicine”. This book shows us a way of living, is the lifestyles of the Prophet (peace and blessings of Allah be upon him). Each person should adopt such a lifestyle, simple and without exaggeration. Some answers to your last letter: I live at 700 km from Bucharest. Islamic League in Romania has offices in cities: Bucharest, Cluj, Constanţa, Timisoara. These cities are cities with many universities. Timisoara is the city closest to my area, at 65 km.1000 Muslims are living in this city, one imam is Syrian. (I have information on the net). I will try to send him an email. In the near future I will write to Mr. Shuaib Suria in the UK for an interview. Thanks for all your advice. God bless you. I haven't written you for a long time because I was very busy .Now I have some free time and I would want to ask you for an advice .I want to present to you a special case , a person who had cerebral commotion and afterward does not have equilibrium anymore .Although the rest of the muscle are working ,he can sit but he can not stand because he loses his equilibrium .I would like for you if it is possible to ask your friends if I Can use a Hijamah treatment for him. The case is very interesting for the doctor and they are curious to see if I can help somehow. I see it as a true challenge .My wife did Hijamah for a 67 years old woman who afterward felt great. I am waiting for your advice. Thank you again for everything and I will keep you posted with everything I do .God bless you. I think of deep in my heart this way treatments are divine inspiration. I think we should follow several steps to deal. First step: Faith in God! The second step: Believe that the Prophet (peace be upon him) is the messenger of God! The third step: To know the inspiring words of the Messenger (peace be upon him) of God. And follow! Let your heart be full of peace and tranquility of God. Learn to think that: “Now faith is the substance of things hoped for, the evidence of things not seen.” Brother Shami is a teacher inspired by God, when he feels that you're ready, you will learn hijamah. Brother Shami taught me hijamah. I have a clinic in Romania, where I treat sick people every day with hijamah. Hijamah is the best remedy for the earth. When I do Hijamah I feel attain divine! May God give you peace of heart! Mr Shami, not everyone understands PROPHET THERAPY! About patient with Cerebral commotion. I talked with the family, I described how the treatment result. Family agreed ! I considered normal to talk with medical committee. Their opinions were divided ! Not allowed to execute HIJAMAH. Everything is in God's mercy ! I am ready. Do God's will. I pray that God give you spiritual joy in this Ramadan. I saw you read my interview. I am happy that God allowed us know, it was HIS will. You know that hijama gives us joy and peace of mind and bodily. Is a special medicine! The Messenger (Sallallaahu Álayhi Wasallam) is our teacher. I fully trust these words: The Messenger (Sallallaahu Álayhi Wasallam) said, “Whoever revives a Sunnah from my Sunnah and the people practice it, will have the same reward of those who practice it without their reward diminishing… “[Sunan ibn Maajah (209)] Thank you from my heart for all teaching which gave me. May God Guide You and Keep You and your family in Optimum Health always, aameen. I have not talked for a long time. Now I'm on vacation and I have time for writing. It was a great summer for me. Much work, more rewarding, more fatigue. I finished working on location with thermal water. I work again in my cabinet. It was a summer with extreme temperatures and more rain. On the other hand has felt the economic crisis. I had many patients and I think I did better treatments. I pray that God watch over them. Hijamah brought me joy, satisfaction and reputation. I did hijamah for all walks. All patients experiencing hijamah felt great and I said at all that is a form of Islamic medicine Inspired by God. My wife has also done many procedures hijamah. Miraculous results in blood pressure and cholesterol. I follow a specialization in Complementary Therapies. You did open a gateway to knowledge for me is one thing I will remember all my life Thank you from my heart for all teaching which gave me. I have great joy when my friends pray and put their trust in God's love and forgiveness. I think everyone should have one month per year of prayer and abstinence, this would make us better and more forgiving. Is difficult but beneficial. I know that Ramadan brought you peace and joy in the heart. God keep you among his chosen! Is necessary to do what The Messenger (Sallallaahu Álayhi Wasallam) said ! Both I and my wife respect Messenger (Sallallaahu Álayhi Wasallam) words when practicing hijamah. I am happy and proud that my wife practice hijamah for women. I pray for her to be under divine protection when run hijamah. Wife should be a helper for her husband. All practitioners should be to teach wives or sisters to practice hijamah. God knows better! Prophetic therapy should be practiced under the guidance of the divine word, if we want to obtain full recovery. In September should be a conference with therapists and I wanted to present therapy hijamah but due to financial crisis, conference has been canceled. I am sure it will be another opportunity to present hijamah in front of fellow therapists in Romania. My vacation ended and I started working. May God keep you and give you everything you need for your happiness and your peace, aameen! I wish you health and joy in your soul. I'm sure God has a plan for us. We believe that prayer should help us purify. God's word should be law for the believer. The Messenger (Sallallaahu Álayhi Wasallam) relieve us GOD will. I know that someday God will judge the world. I try to be prepared for that day. God is merciful and forgiving. Please visit this site www.harunyahya.com to watch some movies and say your opinion. To me is important! Today my wife dealing hijama our older daughter. Mr. Shami, I am happy that you wrote. You're my teacher and I have all respect for you. Your help was both spiritual and human for my. You always have my gratitude. You open the door of The Prophetic Medicine for me and my wife. I am convinced that God is with you at every step of your life. I wish you a year full of accomplishment and joy. Your site will be a blessed realization. I agree to use all the data about me. I am well. In 2010 I made with my wife 46 HIJAMAH procedures. All glory is to God! All patients had a real recovery. I lately attended a course of herbal therapies and Reiki Level 1. I have patients every day, but economic situation has deteriorated visibly in my country. I and my business are under divine protection, I feel this feeling of safety. We have a whimsical winter. God bless you with health and strength! I pray you are in Optimum Health and Allah's Complete and Perfect Guidance at every step and breath of your life, Aameen!